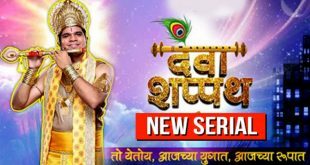 Synopsis: The Colors Marathi TV channel is among a popular face in Marathi TV shows, which is known for giving a number of interesting shows for the audience. One of the TV show include Comedy chi Bullet Train, which happens to be a reality TV show wherein the entire cast and crew will tour to different cities within the state of Maharashtra and engage with audience and have the respective show in it. The show will have the special and gorgeous lady as host called Mrunmayee Deshpande, while it will have others also in the show playing different parts like Mrs. Renuka Shahane, Vishakha Subhedar, Anshuman Vichare, Pandharinath kamble and Supriya Pathare. The show will host a show by the said lady, while it will have judges in it who is none other than the comedy king Makarand Anaspure along with Mrs. Renuka Shahane who would be termed as king and queen of the show respectively. The TV show format has two teams – one if of Susat having two captains- Vishakha Subhedar and Anshuman Vichare and in the second team that is called Khunkhar has its two captains Paddy and Supriya. The show starts from 27th of November 2016, which will be an interesting stuff to watch. Check for more details on the same till then take care.